We're located in the heart of the action - a 5 min walk to Soi Cowboy (made famous by The Hangover), a 15 min walk to Soi 11, renowned for its rooftop bars, speakeasies, pubs & clubs, and 15 min by taxi to RCA, a street rammed with massive clubs with a total capacity of over 10,000 people - just your typical Friday night in BKK! We're 10 min from the skytrain (BTS), subway (MRT), and canal ferries connecting you anywhere you wanna be, yet we’re nestled in a peaceful private street ensuring a good night's rest. Best party hostel I've ever been! The staff is great, trying to introduce everyone and just having fun! Had a really good time and will definitely come back to this great place! I liked this hostel so much ! It's the best place to meet new people in Bangkok. Perfect place to go if you are looking for a fun night. The staff is fking amazing. Shoutout to Joseph for being such a cool dude and thanks for all the free shots! The beds are comfortable and you are close to all the public transportations. 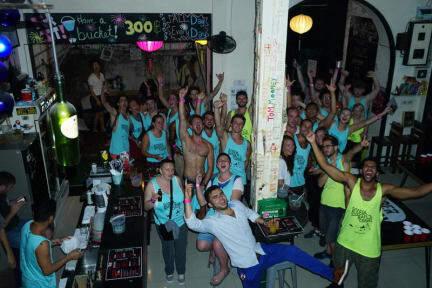 And if you want to go to Khao San Road you just have to join the Bodega Pub Crawl. The only thing you have to keep in mind is, if you don't want to drink/party this is not the place to stay! Everything was fine! Just like every hostel they want to sell their little expensive drinks but that’s no reason to not sleep there. Smart and helpful stuff, great party hostel!!! I had a great stay there. The staff is super nice and helpful and it's easy to meet new people. The drinking games are wild. Nice place, if you want to Party! Not the chilled place anymore as it used to be. Now a real party hostel.